VINAYAKA ENCLAVE is a prestigious project from Siddhi Vinayaka Developers, dedicated in service to provide quality living spaces to ensure customer satisfaction and reliability makes headway in deliverable of real estate in Mangalore. VINAYAKA ENCLAVE offers a promising dream lifestyle, comprising of 24 elegant two & three bedroom apartments. The well planned dwelling units are compact in size and economically priced and featuring excellent ventilation and all required common facilities. 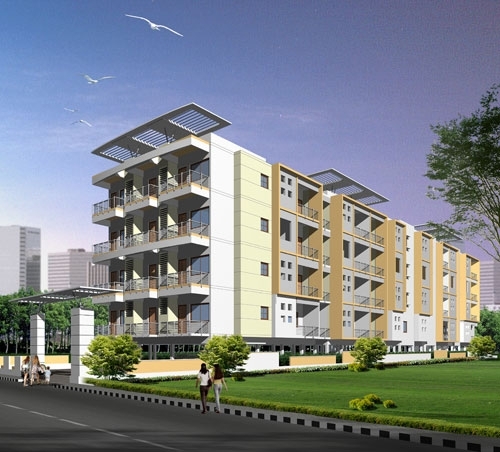 Each Apartment is well planned to give the best use of available space. Top quality construction and the very latest in electrical fixtures and plumbing works ensure value for money. Being located in the residential/commercial area of Marigudi Main Road, Urva, Mangalore – Vinayaka Enclave is located in close proximity to educational institutions, market and shopping areas, places of worship and public transport. The Mangalore International Airport is located at a distance of 20 Kms. away from this place. * Fully framed RCC structure with car parking facility in stilt floor. * Double coat exterior plastering with water proof treatment. * RCC/wood Frames with good quality flush door shutters for rooms and fibrotech shutters for toilets. * Metal putty finish enamel paint for doors and windows shutters and external emulsion paint for frames. * Electrical fittings for recreational area, common toilets, car parking and yard/common areas. * 3KW power provided for each apartment with single phase meter. * Overhead water tank and underground sump tank with required pumps. * Automatic water level controller/borewell in addition to the corporation water supply. * Pressure checked plumbing and drainage lines to ensure total leak proof toilets. * Hot and cold mixer shower unit for all bathrooms. * EWC for common toilet and wall mounted EWC for attached toilets. * Designer wall tiles for upto 7FT height in toilets. * Provision for exahust fan and water purifier. * Plumbing and drainage connection with power point for washing machine.